It is with great trepidation that I address the subject of “organic produce” on this site. Last time I wrote about it, there was a lot of controversy. I am not a fan of controversy when it gets ugly - so I will ask you all to remain respectful of each other and me. Stanford University scientists worked for four years with 237 studies comparing the nutritional benefit of organic versus conventional produce. Guess what they found? They concluded that fruits and vegetables labeled organic were no more nutritious than their conventional counterparts. I found this result to be surprising as did the study authors. I thought that the use of organic fertilizer versus chemical fertilizer would have led to more nutrients in the food that the soil produced. There was a study done in Washington state that found that organic strawberries contained more vitamin C than conventional ones. I wonder if lumping all the studies together for all the produce and meat may have just missed out on the benefits or organic for certain foods. For example, I cannot imagine that the local organic corn that I buy could be comparable to the factory farms in Iowa that use large amounts of petroleum based fertilizer. I can tell you one thing - I have noticed that organic produce tastes better than conventional produce. What I know for sure is that the Stanford result depresses me. I want organic produce to be the Superman of produce that will save the world from pesticides AND poor nutrition. If it had gone the other way, we could rise up and demand all of our food be organic and maybe the price would come down. On the other hand, every day I make choices based on my budget about what foods I can buy. I did my own study about how much organic produce would cost me here: The Price of Organic. I found that my produce bill would be TWICE what it would have cost me if I just bought conventional produce. My point has always been that the health benefits of a diet rich in fruits and vegetables outweigh the risks of pesticide exposure. Do I want pesticides in my food? Of course not. But I’m not going to stop filling my shopping cart with fruits and veggies because I can’t afford organic produce. I get e-mails from readers who feel guilty about not being able to buy organic produce. You know, I think you should be proud that you are buying produce! Do you ever look at the shopping carts around the store? I do this and am always blown away by how little produce people are buying. Sometimes, I want to wear my cape to the store and just shake these people. For some of you, the path to healthy does mean buying organic. For others, the journey is just about putting down the Snickers bar and picking up the apple. 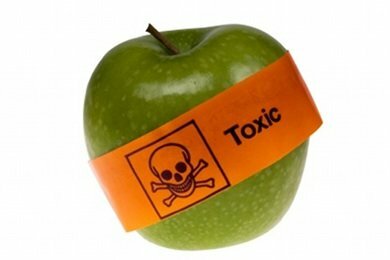 Just keep picking up the apple and don’t let “organic” overwhelm you. Please share your thoughts on organic versus conventional produce. The main reason I buy organic is to protect my family and farm workers from the unknown effects of chemical herbicides, pesticides and fertilizers. I know this is a privilege and I experience it as a responsibility. I think the actual level of nutrition is more related to how long the food has been off the plant which is just one reason that the "buy local" movement is so important. My family buys a mixture of conventional and organic produce and proteins. One of the main reasons we buy organic produce is for the quality/taste. Whether I buy conventional or organic, I always make sure I wash my produce with bio-kleen produce wash. You'd be amazed at how much dirt comes off food you think you rinsed well! Go with organics for the "Dirty Dozen" (always buy organic): apple, bell pepper, celery, cherry, grapes, nectarine, peach, pear, potato, raspberry, spinach, strawberry. And go conventional for the "Clean Sixteen" (low-pesticide foods): asparagus, avocado, banana, broccoli, cabbage, corn, eggplant, kiwi, mango, onion, papaya, peas, pineapple, sweet potato, tomato, watermelon. This study has a LOT of holes!! Cancer, MS, allergies etc from chemical-foods are nothing to sneeze at. This study did not look at anything other than vitamin content. I'd highly wonder who funded this study? Monsanto-the biggest cause of cancer in the US, banned in every other country but the US due to their frankenstein-foods they produce (GMO) and chemicals they develop? The pesticide companies? Follow the money trail. There's trillions of dollars wrapped up in factory-farming and the chemicals/'foods' they make-this is allowed to influence a lot. Organic, or rather 'food' (our foods grown without harmful chemicals should just be called food, and chemical-sprayed/fed produced foods should have the different name. Anyway, organic foods will always, always be MUCH better for all of us, ESP children. They will have better taste, won't contribute to cancers or other diseases and yes-will have significantly higher percentages of NATURALLY occurring vitamins and minerals. That's the key word-naturally occurring. This study is hugely flawed, just wait until its methodology and financial backers are exposed. I was also surprised by that study which really tells you the similarities In what you're getting in each. The differences are important. Re fruit and veggies you are not getting pesticides and genetic modification. Re meat-you're not getting steroids and antibiotics which, personally, I think is a key to the national obesity "crisis" considering how popular and inexpensive " fast food" has become. CSAs ( community-supported agriculture) or "local" have become very popular. The produce is not only fresher, but it provides a certain amount of immunity to the human system being raised and exposed to the same flora and fauna of the area. Local Honey in particular is desirable. Thanks for bringing up the topic. I try to buy organic because of all the e coli and salmonella that is going around, but I buy what looks best and I always buy local from the Farmers Market! Plus I have my CSA boxe which is organic and my own vegetable garden. Sheesh, I like my produce. I think you make some great points; produce over processed wins hands down. Like others, I buy both organic and non, just as long as I avoid packaged crap. Another benefit to organic and local is supporting the smaller businesses and farmers instead of Big Company X. Great post! As a working mom of a kindergartner, and someone who is trying to move more, this whole conversation is overwhelming. I appreciate organic and try to focus my money and energy into buying some key products that are organic (milk, meat) but honestly, I feel like super mom if I can get something on the table that doesn't come from a box. I have taken to canning so I can give my daughter her favorite food without opening a bunch of cans (BPA lined cans) but beyond that is just too hard to balance. I love living close to the Amish community. Without them, I'd be serving lower quality food to my family. Nutrition issues are not complete addressed by this study, in my view (I had previously read of it from other sources). In many cases, if one wants a product without certain ingredients, choosing organic can be the solution; sometimes the only solution. Ketchup without high fructose corn syrup, I have found no brand the meets this criterion save Heinz Organic. Want to avoid GMO soybeans, the only way you can do that is buying organic because the industry spends millions upon millions of dollars a year lobbying to avoid being required to label this ingredient. The jury may be out on GMO, but U.S. industries have proven themselves perfectly willing to sell products that cause cancer, cars that explode when struck from behind, and pills that increase the chance of heart attack, long after learning of the risks involved. We have to take care of ourselves--caveat emptor, the economist battle cry--and one way is to buy organic foodstuffs. At least with organic, you know what standards the producer had to meet. I spent a good part of yesterday reading about this report and the timing of it as well. Smart shoppers know the difference between organic and conventional produce. Its never been just the nutritional content, its always been what isn't in the organic which makes it better for growing children and us adults. There are scads of ideas for buying and preserving organic/local produce when plentiful and on sale. When not available why not go without? If we eat seasonally plus what we freeze, we can eat economically too. Its very empowering to meet this food challenge and vote with our grocery dollars every week. I do not trust the timing of this report with California's prop 37 coming up and Monsanto and their ilk already spending over 25 million to oppose it; this is propaganda to confuse voters. I still don't believe it and here's why: they didn't see a difference in what they were looking for. That doesn't mean that there is no harm in all those chemicals or irradiated or GMO (genetically modified) foods. Cancer? Autism? Were they looking for those things? And also, in all studies, it would be hard to REALLY test well because you'd need people who ate organic diets only vs. those with chemically treated foods. Good luck doing that! There are SO many chemicals in our world today. You can't tell me this isn't impacting our health. This one article wants us to think it's okay to let Monsanto do what ever it wants. "Go back to sleep, everyone. Everything is fine. Keep eating those chemicals. They are perfectly safe." i buy meat eggs milk organic ,i feel it is a better source. but fruit and veg. i dont i wash everything very well with a solution sold in the grocery stores . I agree with the overall theme of your message: it's the pesticides I think about on certain foods (i.e., recent report/article tauting the 10 [or was it 20?] fruits and vegetables you should by organic... I think these were at the top of the list:apples, strawberries, blueberries, spinich and lettuce. I maintain that if something isn't healthy for the world, it isn't healthy for me either. I live in an area where I can't get everything organic, but what I can, I do. It is a myth that organic necessarily means more expensive. If you go to farmer's markets, you can often pay far less than supermarket prices for locally grown, fresh, organic produce. CSAs or farm share agreements can save you even more. Best of all, grow your own! Gardening is a fun and productive activity, and there's no better way to know where your food came from. And "I don't have time" is not a very good excuse - I planted and grew a garden while studying for the bar. After the initial startup, which was a couple of hours of work, it took me ten minutes a day to maintain. We too buy organic as much as possible because of CHEMICALS! I never questioned what had more nutrients, just that I wanted my family to have the least amount of chemicals in their bodies. We eat the at little as possible of pre packaged foods. also do some research on the USDA organic foods, they lowered the standards of the requirements so they could get their mitts on the money! I can't afford to buy organic all the time but organic has allowed me to eat fruits I haven't been able to touch in years. I've had allergic reactions to certain fruits and discovered I was allergic to the pesticides on the fruits that were still there no matter how much I washed them. I almost cried when I discovered I could eat an organic peach without having a reaction (I LOVE peaches!). Nothing feels better. I've had the most success buying local from farmers who use organic practices but are not necessarily certified organic. In the end, I agree with Snackgirl, eat more fruits and veggies and buy what you can afford. What i want to know is where is the study proving that eating PESTICIDE-LADEN food is good for you?! Why is the burden of proof on organic food? it defies common sense.